We had eleven German cities released prior getting to this one – Starbucks You Are Here Germany mug. Believe it or not, this is the 12th mug from this country. – German sausages – there are literally hundreds of different German sausages. Important to note, that sausage names like Bratwurst, Kochwurst, Rohwurst, Brühwurst, Blutwurst or Leberwurst do not represent a particular German sausage, but a sausage type which is made in a particular way. – beer mug – as per-capita beer consumption, Germany is third in Europe (after Czech Republic and Austria). Brewing is a major part of German nationality and is done according to a law – the Reinheitsgebot, which permits only water, hops, and malt as ingredients. – soccer ball – soccer is the most popular sport in Germany. It’s national team was always considered a favourite at FIFA World Cups (winning four of them in 1954, 1974, 1990, 2014) and other numerous championships. – Brandenburg Gate – one of the most well known landmarks in Berlin. It was built in 18th-century to represent peace. – Reichstag building – It was opened in 1894 and housed the Parliament of Germany until 1933, when it was severely damaged after being set on fire. It was left unused till 1999, when after 9 years of restoration it welcomed the modern Bundestag (the Parliament). – Fernsehturm Berlin – is a television tower in Berlin constructed between 1965-69. It is one of the popular modern landmarks of Germany. I like the colors, but this mug looks like a missed opportunity. Usually the “country” mug is a chance to show national landmarks which cannot be portrayed on “city” mugs (i.e. Mont-Saint-Michel for France, Stonehenge for England, etc). 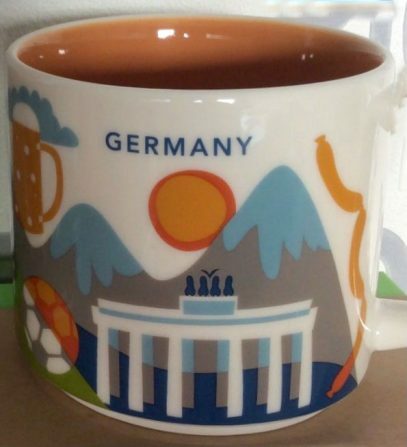 This one looks more like a new Berlin mug, rather than a Germany one. I wish they had chose Neuschwanstein or Holsten Tor instead. Totally agree with you Andrea. I think SB slacked here.